It is a place specifically to honor those of the Third Infantry Division killed in Iraq. A tree for each soldier lost… a living monument to those who gave all. A place that families and friends and comrades come to remember… to reflect… to pay respects. It is a place that provides comfort… and for some, peace. It is Warriors' Walk at Fort Stewart, Georgia. There are now 373 trees. Four were added October 19. Two of those new trees were for soldiers in Noah's battalion/regiment. There are hopes that these will be the last to be added to the Walk; with at least eight more months in this deployment, it is a wish prayed with fervency and many promises attached. Many family members and friends regularly leave mementos for fallen 3ID soldiers: pictures with family members, sports teams' memorabilia, plaques, toy motorcycles and even the occasional bottle of a soldier's favorite beer. Last December, as family members of the Third Infantry Division were preparing for their loved ones’ deployments -- some for the third time -- they paid homage by decorating the Warriors' Walk trees of family and friends. But the wife of the (now) Command Sgt. Major and others noticed that many trees had no decorations and she vowed to do something about it. 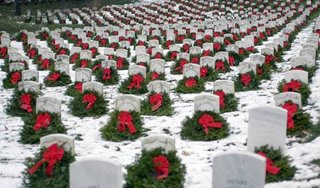 To sponsor a wreath, click HERE or Go to the Wreaths Across America Web site, www.wreathsacrossamerica.org, and click on the "Become A Sponsor" link on the top left side of the page. The cost is $15 each and sponsors can choose to buy more than one. For an extra dollar, you can order a Wreaths Across America Lapel Pin; for $18 (+$10 flat rate shipping) you can order yourself or someone else (like your favorite veteran) a Personal Remembrance Wreath which is identical to the Sponsored Wreaths. It is a 501c(3) charity so sponsorships are tax deductible. To ensure the sponsored wreaths are used for the Warriors Walk initiative, you must type-in "Warriors' Walk/Ft. Stewart" on line two of the address information section on the sponsor form. Sponsors leery of paying online can also mail a check made out to Wreaths for Warriors Walk to: Wreaths for Warriors' Walk, c/o Anthony Justi (project co-chairman), P.O. Box 3533, Fort Stewart, GA 31315. Checks will be consolidated and forwarded to WAA. The wreath-laying ceremony is scheduled to take place on Warriors' Walk on December 15 at noon. I hope all who are or can be in the area will attend. Wreath-laying ceremonies will also take place at Arlington National Cemetery and the other National Cemeteries around the country on that date. More information is available at the WAA website. You can also volunteer to help place the wreaths at Warriors' Walk by contacting Anthony at wreaths4warriorswalk@yahoo.com. You may also volunteer at your local wreath-laying ceremony via the WAA website. The bells were the idea we came up with at the [Support3ID.com] reunion back in June. As we visited Warriors' Walk we realized how quiet it was with a few little dings here and there put off by chimes down the row of trees. We also noticed how over 250 trees out of those planted then did not have a single thing on or around it (they purge the decorations every few weeks or so and place them in their own section in the [3ID] Museum). This is when we decided as a token of our love, appreciation, utmost respect and gratitude, we wanted to buy bells or chimes to place in all of the trees so that they could remain there instead of being purged as all of the other decorations are. Thanks for the links and this opportunity to show our gratitude and respect, SSM. Will pass this along, too. I have walked between the Eastern Redbuds at Fort Stewart on several occasions. It is a fitting tribute to so many who gave their own lives that other might live in freedom. As I walked between the redbuds I felt I was walking on sacred ground. I wish every American would take the time to stroll down "Warrior's Walk" and read the names on the markers. These names represent the very best of our society. The most noble and courageous men and women our country has ever produced. May God bless their souls.